The rhetorics of Nordic larp often imply that role-players play in an intuitive fashion guided by the character, rarely or never contemplating their actions during the game. In reality, however, we are often keenly aware of what we are doing as our characters and why. This paper explores the practice of making in-character decisions based on off-game reasons – also known as steering. The Art of Steering – Bringing the Player and the Character Back Together by Markus Montola, Jaakko Stenros & Eleanor Saitta. Oliver Nøglebæk is a great mind and fortunately for the community, also a larper. He has put together a great list of links as a primer for Nordic Larp. Check it out! In the workshop we also did a lot of freeform scenes within the playgroup. For the characters we did scenes from the past, the future and “what if”-scenes. This turned out to be very strong. We had a black box, which was a simple room, where a game master would help you set up the scene you needed. Emily Care boss interviews Anna Westerling, larp designer and organizer of Stockholm Scenario Festival. Read up on Annas thoughts about the festival as well as her views on game design and the history of Nordic freeform and black box larps. When do we know if the choices we make are the right ones and what should we really do with our lives? During a few hours, twelve players dive into the stories of Agnes, Markus, Olivia & Thomas to meet them during three stages of their lifetimes. Blackbox Malmö is an organization hosting and promoting short larps in the Malmö-region in Sweden, in January they organized The Kick Inside. How is life under occupation? 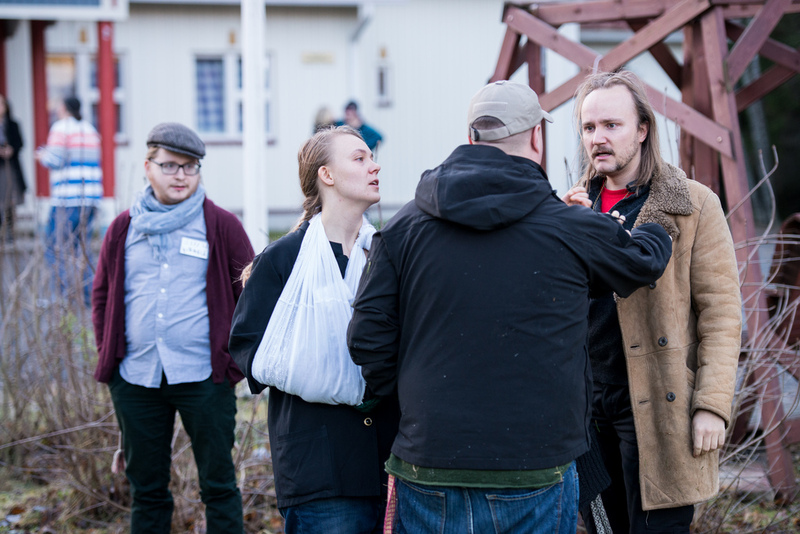 A team of Finnish and Palestinian organizers created the larp Halat hisar, which took place in a modern day Finland under a fictional occupation. The project was well documented with photos by Tuomas Puikkonen and in this post your will also find some thoughts about the larp by players and organizers. Nordic LARP is a fascinating medium and we would encourage Serious Games designers to have a look at it from the perspective of education and learning. It offers a different view to learning and education and could be what we are all looking for. Serious games is a term for games that serve another purpose than only to be entertaining, such as an education game. On a blog post at GALA – The Games and Learning Alliance three researchers from the Heriot-Watt University discuss if serious games and AI technology could benefit from Nordic Larp. Thanks to Jaakko for the tip. During the fall my collegues from LajvVerkstaden made a one week introduction to Nordic Larp and edu-larp the GALA-researchers in Edinburgh. Nordic LARP, should the Serious Game community think about it? The Swedish campaign Krigshjärta (Heart of War) is known for running great war larps several times a year. Every other summer a bigger event is held, and this year it was Krigshjärta VI. In this post you will find some stunning photos from the larp as well as concept art inspiring the participants into making all the amazing costumes and gear that makes Krighjärta come to life. I myself have been very sensitive about the game, but what makes this the larp rich is precisely that larps are a great vehicle for science-fiction. The reflection created by the game about gender, masculinity, femininity and cultural construction is fascinating and it’s not a message delivered on a plate by an author but a group reflection that emerges from the larp . French Baptiste Cazes has written a three piece review about the larp Mad About the Boy. The first part describes the context of the larp and his preparations. The second about workshops, transparency and the game design. In the the third and last, Baptiste describes the use of the black box and the debriefing methods. The articles have been posted and translated by Leïla Teteau-Surel at the French larp blog Electro-LARP, a site in English for larp news from written weekly by the French community. The original articles are to be found at Electro-GN, which is the French language parent of Electro-LARP. For further reading, here is the review by Thomas B. And finally. The larp will be played in France 2014. Don’t miss out. Grenselandet is a great short larp festival organized in Oslo by Fantasiforbundet. I visited this year hosting my larp Papers, as well as playing Hirelings and Sarabande. I also attended the launch of the book Larps from the Factory. I also got the chance to get some thoughts about the history of Grenselandet and what is has become by the main organizer Martin Nielsen.